Being a keen sportsman from my school days, I’ve always enjoyed the competitive side of running and then latterly cycling, whilst still trying to climb the corporate ladder in a full time career back in the UK. Having realised my true passion and calling was combining this with my love of history, something of which I studied at College, it seemed a natural progression to become a qualified cycling tour guide. 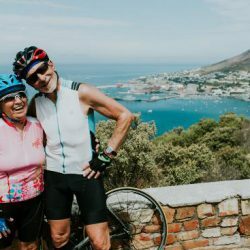 Having spent many happy holidays in Cape Town, we(my wife and I) decided to follow our hearts and move to the stunning Cape and set up our cycling tour business here, something that was sadly lacking on our visits. Being a very experienced and passionate cyclist I believe cycling is the only way to see and experience how much Cape Town and her surrounds has to offer and how truly breathtaking the scenery really is. Come and see for yourself!